Like most industries, the philanthropic sector has developed its own jargon. An example worth exploring is theory of change (ToC). I’m not sure there are many buzzwords currently floating around that are more broadly used with less uniform understanding. To help work toward clarity, I wanted to take a moment and put forward a succinct definition of what we at Geneva Global mean when talking about theory of change and why it needs to be an indispensable part of your work. A theory of change articulates how we believe change will happen, and as a result, how we plan to invest time and resources to contribute to that change. Thus, much of the time we use the term theory of change, we are trying to unpack how a given organization or program anticipates bringing about a desired change. These statements linked together test logical connections and communicate an organization’s or initiative’s focus, plan, and ideal outcome in a succinct, comprehensible way. Obviously, this is a very high-level theory of change, and it doesn’t include all the technical factors related to disease elimination or eradication. Implementing the and statement in the middle can be a very complex undertaking, as is the case with the current effort to eradicate polio. But the theory of change above captures the essence of the problem, the proposed solution, and the desired outcome. Given the complexities often associated with an issue, and with operationalizing the and statement in the middle, theories of change can be more detailed and complex as well—some interesting examples include those from C&A Foundation and the Global Fund for Women. Though these are very complex statements, they still serve two essential functions: they articulate how each respective organization believes change will happen, and as a result, how each plans to invest time and resources to contribute to that change. Sometimes what is referred to as a theory of change is actually a more fully developed logic model, an outcomes map, or even a strategic white paper (e.g. Fairtrade International and VSO). These documents can serve a similar function as the theory of change, but one drawback is that they often can’t be read and understood quickly, like the If/And/Then framework, which forces clarity of thought and focus. So, why do you need a theory of change? Having a well-articulated theory of change is crucial to creating change. A great way to illustrate why starting with a clearly defined theory of change is necessary is by applying it to a granting program. The aim of many of our clients’ granting programs is life change, which is often interdisciplinary and complex. No life exists in a vacuum; all of us are part of broader eco-systems that have multiple dimensions: social, economic, and public health, among others. Without clarity on the long-range expectations for progress in a theory of change (the then statement), determining a program’s key performance measure is not feasible—and determining efficacy at a high-level becomes an ambiguous and subjective exercise. 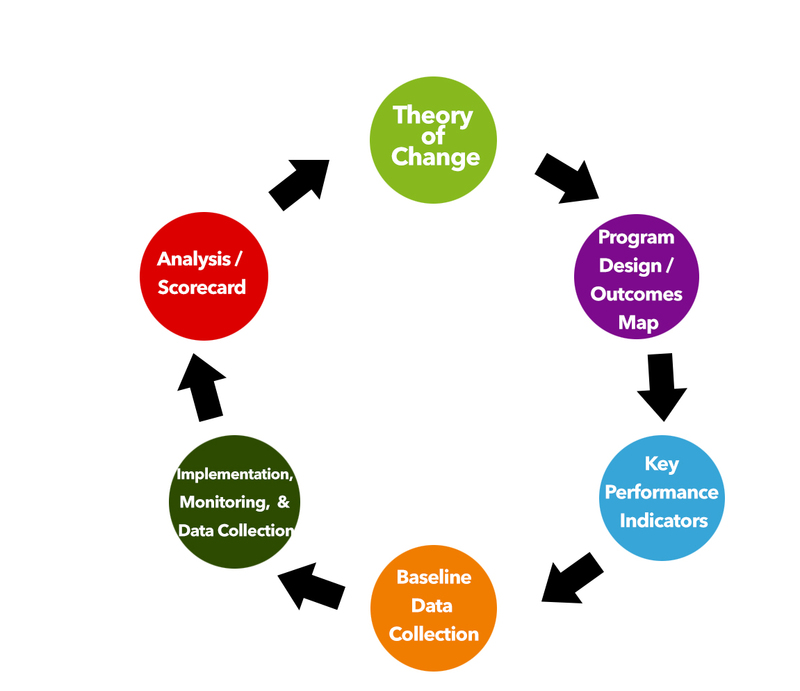 In our work, taking an impact orientation to program management follows the cycle below—starting with a clear theory of change that provides the foundation for determining key performance indicators and measuring overall success, which can inform future theories of change. 1. It creates the foundation for your grant-making strategy. This is the key reason that we always recommend that organizations articulate their theory of change before all else. 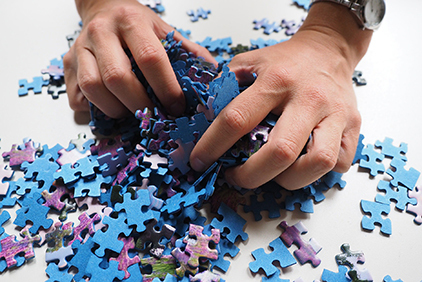 A lack of clarity on your theory of change at the beginning too often results in many funders and non-profits having little evidence of the positive impact of good programs. The inability to align program outcomes back to your theory of change undermines an organization’s impact claims, and will likely lead to credibility gaps with funders, board members, and other stakeholders. Creating your theory of change up front ensures clarity in your organization’s overall strategy—avoiding miscommunication issues. Being clear about your theory of change at the outset forces critical reflection on the problem definition, the planned activities, and the hoped-for outcomes. Sometimes this reflection will provoke hard conversations and realizations among (or within) various organizational stakeholders. Addressing these inevitable conversations early on allows for healthier processing within an organization and further strengthens your team’s buy-in. Requiring dialogue among your organizational stakeholders can result in clearer processing, the opportunity for a more participative collaboration, and a theory of change that can be better owned by the entire team. This then gives everyone in your organization a unified understanding of how the organization believes change will happen, which can be shared in a comprehensive, succinct manner. 4. … and sharpens messaging. Since team members are clear on the theory internally, it makes it much easier for them to communicate that externally. 5. It creates a pathway for systems change. Once the theory is clearly articulated, it becomes much easier to identify the possibilities for shared action with fellow collaborators. This can then leverage efforts for systemic change because specific areas of focus and complementary gaps become obvious. 6. 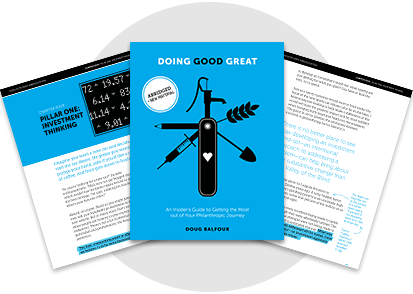 It serves as a guide to measuring success. The theory of change can be viewed as a north star to understanding progress, achievement, or failure and to determining efficacy. Subsequently, this can aid in developing achievement measures, key performance indicators, and strategic implementation decisions. 7. It provides a framework for decision-making. From strategic to tactical decisions, the theory can help drive decision making forward around investments of time and resources at all levels of program management. Most organizations, and pretty much any program, operates from a theory of change, whether explicitly stated or not. But, not every organization outlines and uses them to their fullest advantage. Theory of change may be philanthropic jargon. However, articulating the problem your organization wants to solve and how your organization believes it can solve it provides a framework for decision-making and assessment at all other levels. Without first understanding and articulating the change your organization wants to achieve, assessing the impact of your work (and the accuracy of your theory) is impossible; as a result, so is the opportunity to communicate impact internally or externally. Clearly articulating a theory of change requires organizational investment and discipline, but we are confident, stemming from Geneva Global’s track record of working at all levels of philanthropy, it will yield your organization outsized philanthropic gains in the long-term.